Llano is the deer capital of Texas because they are so profuse in the Llano Basin. It's no wonder when they have the spring-fed Llano River to help sustain them. 'Llano' means plain. The Llano River was originally named 'Rio do los Chanas' (Chanas being a tribe of the Tonkawas) which is phonetically similar to Llano and eventually changed through misuse. Llano is home to Llanite, a brown granite with blue crystals and pink feldspar which is very rare and found only in this area. Rock hunting for quartz, granite, gneiss, flint, schist, feldspar, limestone and llanite is a popular pastime. 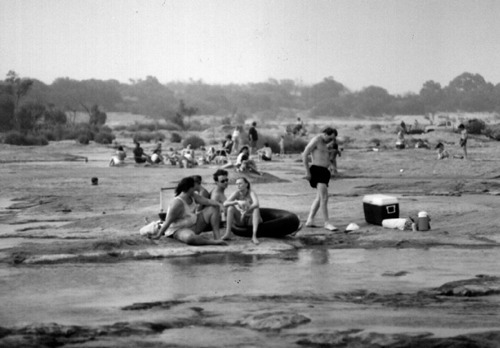 The Slab is a spot in the Llano River where the water runs over large granite outcroppings and sandy beaches have formed. It is a popular swimming, tubing and picnicking site. The water is perfect for both wading and deeper swimming. The Slab is open to the public, but not maintained as a city park. Therefore, there is no drinking water or rest rooms.